San Juan is appealing to nature lover because it offers a wide variety of Eco-tourism activities all within close proximity to each other. Where else can you hike through a mountain trail while observing abundant plant and animal life, refresh yourself by a rambling waterfall, and swim in an emerald green ocean teeming with marine life, all within a few hours from Manila. Wether you wish to hike, swim, observe and study the environment or simply relax in beautiful natural surroundings, San Juan has plenty to offer. Mountain, coast, river, rice fields and other ecosystems can all be appreciated not just separately but in relation to each other. One of the must-visit places in San Juan. The original church was located in Barangay Pinagbayanan. In 1890, it was moved to its present location at the Poblacion. In 1894, Father Celestino Yoldi, a Recollect, started constructing the church that still stands today It eventually became known as San Juan de Nepomuceno named after St. John Nepomucene, the town's Patron Saint. As a tribute to Virgin Mary, Flores de Mayo is celebrated throughout the month of May. Each night of May, festivities in the chapels of San Juan begin with the "alay" - a ritualized ceremony consisting of singing, praying and offering flowers. In many places, merienda and dancing follow. At present, you will be expected to give a small donation for maintenance of the chapel. The town fiesta takes place on May 16 of each year. The town comes alive for this event and you are certain to be invited in homes of locals and offered with food and drink. Bands play in the street and a procession marches through the main thoroughfares. Travelling peria (fair) and sedera (market) are also part of the festivities. San Juan has a long and colorful history that was handed down through generations mostly in oral tradition. It started as a small village that was part of Rosario, Batangas. Originally called "Bolbok" because of the bubbling spring located near the town, it became a separate municipality in 1843. Since then, the town has survived epidemics, natural disasters and occupation by foreign government. A written history of the municipality, including photographs and genealogy records, are available in the municipal library. Much of the town's past can still be observed today in the form of heritage houses and old structures, such as St. John Nepomucene Church. 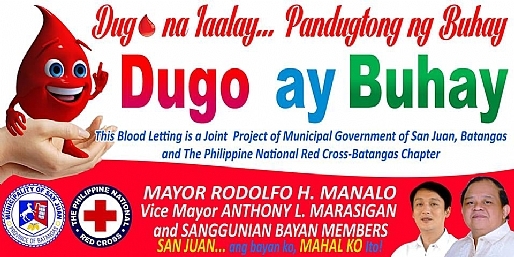 San Juan, Batangas holds an annual event to showcase the three major sources of livelihood in the municipality - lambanog, palayok-making, and the growing tourism industry. Held in the second week of December, the festival promotes creativity, ingenuity and hard work among the town folks. The highlights of the event includes street parade, court dancing competition, agro-tourism fair and search for Ms. San Juan and Ginang San Juan, among others. Since the 1900s, the locals have been producing lambanog - a traditional product of San Juan. Sap is taken from coconut trees and distilled to create a product that is 49% proof, 98% pure. Lambanog making is an industry in almost 10 barangays in San Juan. Roadside stalls sell a variety of concoctions and flavors. To watch the actual process, any of the lambanog distilleries can be observed and toured. The residents of Barangay Libato, Palahanan I & II have been making pots (pottery) of different sizes, shapes and designs since the early 1900's. Clay is taken from the banks of nearby Lawaye river and the pottery is produced in numerous small kilns run by local residents. The final products are sold along the along in Palahanan I and II, and also in Manila and surrounding provinces. Employees working in the factories are happy to give demos and answer questions. These products can be purchased directly from the factory at very low prices. San Juan, specifically Laiya, has a majestic coastline with several beautiful beaches, clean water and white sand. Many people, not only from San Juan but here and abroad visit the different resorts to unwind, de-stress and bond with their families. Adventure-seekers can mountain-hiked and breath fresh air at Mt. Daguldol-Lobo mountain range that lies along the south western part of San Juan and provide excellent possibilities for camping and hiking. A large variety of endemic plant species and birds can be found here. The hike to Naambon falls is steep and rocky in several areas, but for most part is leisurely and invigorating even for those with not-so-advanced fitness level. Day trips can be made, approximately one and a half hours walk from Hugom Environmental Guides Association (HEGA) Headquarter. It has several look-out points with views of dense forest and Tayabas Bay. Naambon Falls offers a secluded, undisturbed series of falls and small pools where you can refresh yourself with cool and clean mountain water. Swimming is difficult as most of the pools are small and shallow. Bird watching is an exemplary Eco-tourism activity because it is non-invasive and benign in nature. The basic requirements are a pair of binoculars and a bird identification handbook. During bird watching, one must be patient and disciplined, and refrain from creating noise. As most birds are active before and during sunrise, and towards dusk, bird watching tours should be arranged during these time of day. The giant fruit bat has a wing span of up to 5 feet (1.5m). It is the largest bat in the world. It has a very keen sense of smell and a very long muzzle. They roost upside down in the trees and wrap their wings around their bodies. Feeding time is at dusk when they set off to eat fruit. They sip the juice but let the seeds and the rest of the fruit fall to the ground, thus helping in biodiversity of plants and trees. The female give birth to one baby at a time. They will carry their baby around with them for two months. Mangroves are trees that grow in the coastal zone and are highly adapted to marshy and brackish environment. Their roots are submerged underwater during high tide and exposed during low tide. Mangroves are a valuable part of the marine ecosystem. They provide food and shelter to various group of marine animals, protection against storm surge, typhoon and soil erosion, and serve as land builders through soil accretion. San Juan has 496 hectares of mangroves and swamp area. Located along the coasts of Imelda, Bataan, Nagsaulay and Subukin, there are over 100 hectares of intact mangrove forest - the largest in all of Batangas Province. It is classified as a finger type of mangrove as it is a strip located along the coast and is covered by daily tides. The predominant groups are Bakauan, Bungalon and Pagatpat.